It started with this picture. This one, right here. Leaving aside the lack of other magazines on the shelves with people of color (I looked, and every other glossy had a white lady on the front), this juxtaposition has been haunting me. 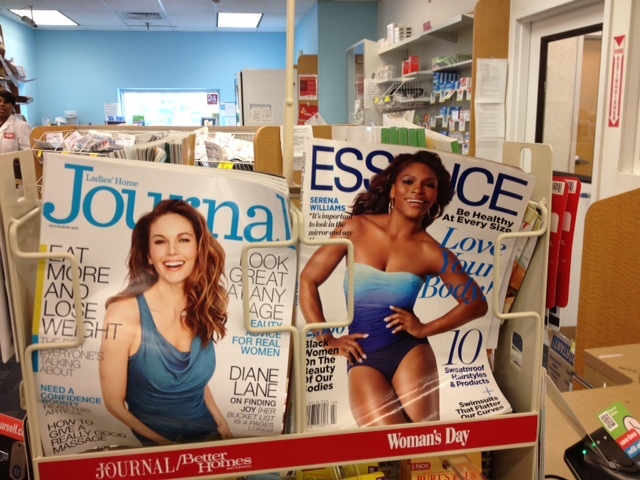 There is an abundance of information and articles about the intersection of racism and body image. I am in love with the idea of natural bodies being loved, enjoying differences in shape and appreciation of larger women (my own bias, no doubt, as a larger woman). More in depth analysis can be read HERE and HERE and HERE for background. Conflict and problem for me stems from the idea that only women of color can appreciate their bodies as they are, that only women of color have curves “that aren’t going anywhere.” My argument isn’t overtly about black versus white, it’s another permutation of the long standing idea that white women are supposed to look a certain way versus women of color. There is a long history of racism at work here, and I’m unable to speak from my experience, as I come from a place of privilege as a cis, able-bodied, white woman from a middle class home. However, to change these attitudes we woman need to work together rather than against each other, toward appreciation of all bodies. We need to understand the science of weight, that our bodies resist change, and that healthy people exist in all sizes. Love your body.